Efficient communication, collaboration, data exchange and sharing are crucial for the success of today's many multi-disciplinary and interdisciplinary work environments. The implementation of computer integrated environments (CIE) is increasing and the requirements engineering necessary for the development of these systems is critical. 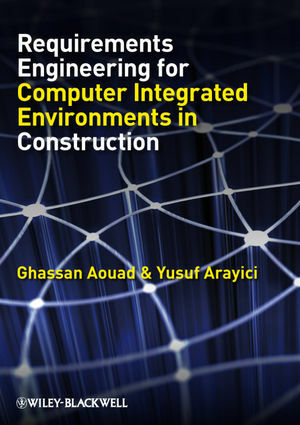 Requirements Engineering for Computer Integrated Environments in Construction provides an important source of information and advice for organizations needing bridge the gap between users and developers in the implementation of computer integrated solutions as well as for consultants providing services to their clients in CIE development. The framework explained in the book is comprehensive and accessible. It provides a set of tools and techniques enabling readers to design, manage and deliver effective CIE-type systems in any complex organization – from construction and manufacturing to the information technology and service sectors. Construction companies for example, can use the framework provided to implement building information modelling to manage the diagnosis, planning, implementation and monitoring stages in BIM adoption. Based on real experiences and lessons learned from many years of system development, this book offers an excellent resource for researchers and postgraduate students interested in CIE development for all multi-disciplinary and interdisciplinary work environments. Ghassan Aouad, is Dean of the Faculty of Business, Law and the Built Environment and Professor of Construction IT & Management within the School of the Built Environment. Dr Arayici is a researcher in Geomatics Engineering in the Civil Engineering Faculty, Technical University of Istanbul, Turkey.